Signed lr: "W. T. Trego with the W and both T's combined to form a monogram. The work was framed by Whitehead and Mangan of New York City, whose stamp appears on the paper seal covering the back. Scotch-taped to the top is a paper label of uncertain origin reading: "'Scouting Party'/Original Pen and Ink Illustration by/William T. Trego. Circa 1900. There is also a small circular label reading "A-2." 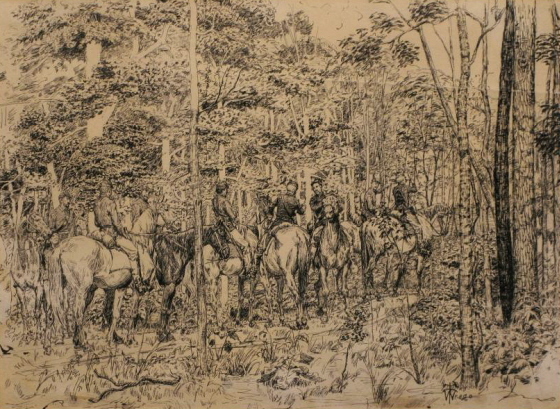 This drawing was almost certainly intended as an illustration and is similar in style and medium to his drawing of Hancock’s Corps Assaulting the Works at the “Bloody Angle” done in 1887. The distinctive "monogram" signature appears on only two other works, in 1881 and 1887. However, a label on the reverse suggests a date of c. 1900. Once owned by Whitehead and Mangan of New York City, it was purchased by the current owner in May 1978 from N. Flayderman and Company, Inc., of New Milford, Connecticut. The drawing is in excellent condition and framed under glass.